NOAA Study ? nds a $7B U.S. Observing System (IOOS), for her take on this initial survey and her perspective of its impact. 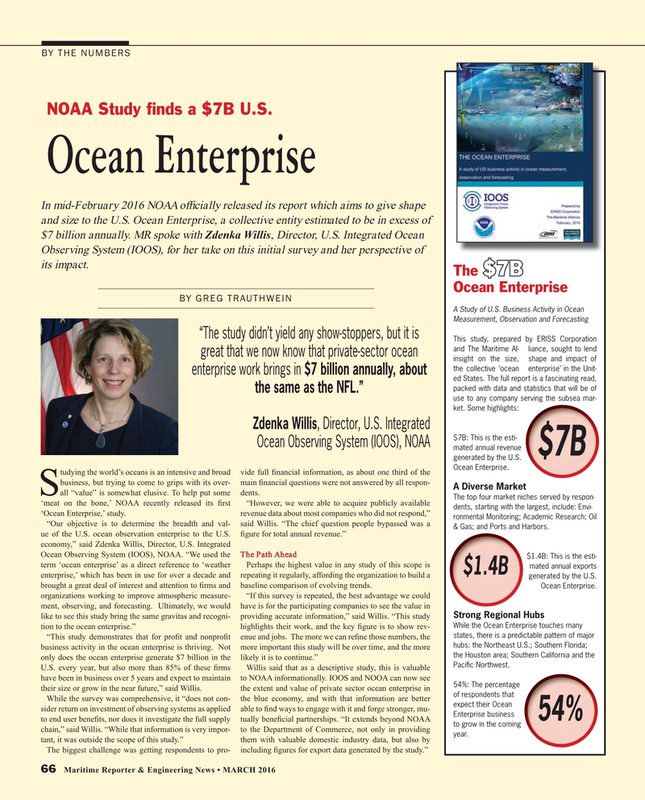 Ocean Observing System (IOOS), NOAA mated annual revenue $7B generated by the U.S.
Sall “value” is somewhat elusive. To help put some dents. The top four market niches served by respon- ‘meat on the bone,’ NOAA recently released its ? rst “However, we were able to acquire publicly available dents, starting with the largest, include: Envi- ‘Ocean Enterprise,’ study. revenue data about most companies who did not respond,” ronmental Monitoring; Academic Research; Oil “Our objective is to determine the breadth and val- said Willis. “The chief question people bypassed was a & Gas; and Ports and Harbors. Ocean Observing System (IOOS), NOAA. “We used the The Path Ahead $1.4B: This is the esti- term ‘ocean enterprise’ as a direct reference to ‘weather Perhaps the highest value in any study of this scope is mated annual exports $1.4B enterprise,’ which has been in use for over a decade and repeating it regularly, affording the organization to build a generated by the U.S. brought a great deal of interest and attention to ? rms and baseline comparison of evolving trends. Enterprise business 54% to end user bene? ts, nor does it investigate the full supply tually bene? cial partnerships. “It extends beyond NOAA to grow in the coming chain,” said Willis. “While that information is very impor- to the Department of Commerce, not only in providing year.